Filter move succeeds but filter is "Unknown"
Timeout error after executing "Recalibrate All -->"
Images taken using a grating (spectral or zeroth order image) look like darks. The grating is at the wrong tilt, or the grating cover was not removed when the grating was installed. Have summit support personnel check for and, if necessary, remove the cover from the grating. A red LED inside or outside of the instrument has been left on. Send someone up to locate the source of the illumination. One likely place is a red LED on the DEIMOS handpaddle which is lit when the paddle is left in MANUAL mode. Switch it to COMPUTER mode in order to disable the LED. Another thing to check is the plastic housing enclosing the optical encoders on the grating tilt stages, which can be deformed and thus leak light. Spectra and/or direct images taken on the grating appear to be shifted vertically on the CCD images relative to their customary position. The grating tilt encoder has lost its positional reference, most likely due to momentary loss of power to the tilt ensoder. Images show a significant jump or drop in the bias level in one or more amplifier. The CCD readout electronics may be too warm. Check DEIMOS temperatures by issuing the temps command on polo. If electronics temps are too high, then have summit staff remove covers on the electronics as needed to improve airflow. DEIMOS images show data values as NaN. The CCD readout electronics are malfunctioning, perhaps because they are too warm. If data values are bad in only one amplifier, it may be a malfunction on the Leach board. Try increasing the bias level by decreasing the value of the VIDOFFn keyword for the affected amplifier. DEIMOS images show data values as NaN or zeros (depending on which version of DS9 is used to open the images). The section of the image affected corresponds only to amplifier A or B. The CCD readout electronics are malfunctioning. In the Dashboard GUI hit Start Here! to open the SETUP/OPTIONS window. Take an image in Direct mode with the Dashboard GUI and the command goi to check that the amplifier mode has actually changed. It may be that a light source was left on in DEIMOS. An example is when a grating system errors and the error is not cleared because it is not the primary grating in use. use checkLamps to see if any of the lamps is currently on. If a lamp is on, turn it off. For arclamps, you can simply use the dashboard to turn the lamps off. If it is a motor lamp, you will first need to halt the stage and then turn the lamp off. We will use the grating 4 tilt mechanism as an example. mmot g4tltfop=off # turns off the lamp. Note that the keywords in the output from checkLamps shows what keywords to modify to turn the lamps off. Focus images show very low counts during the focusloop (R+dome) script. The tertiary mirror in not facing the correct Nasmyth focus. Contact your Support Astronomer, who will take the proper actions to ensure the tertiary mirror is rotated to face DEIMOS Nasmyth focus. Compass roses display the wrong orientation. FACSUM reports incorrect drive angle on the rotator. The DCS keywords ROTPDEST (demanded position) and ROTPPOSN (actual position) differ by many degrees. The DEIMOS rotator control computer (roto) has lost its DCS connection. See corrective actions described below. Newly acquired images do not appear on the the ds9 image display GUI, even though the GUI appears to be alive and responds to mouse input. The ds9relay widget is present and active. The X server you are sitting at is no longer secure, possibly because someone has used the xhost command to open an insecure line of communication. to disable all insecure xhost access. If this does not work, log out and log in again. Newly acquired images do not appear on the the ds9 image display GUI, even though the GUI appears to be alive and responds to mouse input. The ds9relay widget is not visible on the screen with ds9. The ds9relay task has died and needs to be restarted. Run the ctx command on polo and verify that ds9relay is not running. From the OpenWindows menu, select the item DEIMOS Control Menu > Subcomponents... > Restart ds9. Verify that a ds9relay appears. If it does not appear or dies, see the item above regarding xhost problems. An output directory is defined (outdir commands returns valid result) but images are not going there. The output directory does not exist. Create the output directory using the mkdir command. Images are saved with strange filenames (e.g., d0217_0001.fits.old.PdGWS5) and FRAMENO keyword does not increment between frames. Either the ADDFRAME keyword is set incorrectly or the DEIMOS daemons are in a bad state. Run testAll to verify that the ADDFRAME keyword has the correct value. Re-load DEIMOS default settings from Dashboard Initialize panel. Kill and restart all DEIMOS daemons using the recommend procedure. Restart all DEIMOS GUIs and verify that images write properly. DS9 regions option above the image and below the title bar are inactive. Create a default region on the image. Default is usually a circle. Regions option should now be available. The host computer is improperly configured. *       by default system uses 2% of RAM; or, as reported by "sysdef -i"
*       slowdowns to happen when writing files that exceed about 80 MB. *       If we understand correctly, this may be a remedy. Keywords such as RA, Dec, ROTPPOSN, etc., are not found in the image headers. These keywords can still be obtained from the polo command line via show -s dcs commands. The watch_ccd process has lost its connection to DCS and needs to be restarted. If a ROTPOSN value is shown, that's good news. If no output is received, then the keyword is missing from the header and the problem has not been fixed. Keywords are found (or reported) to be missing from image headers. Communication with a keyword service is interrupted. or by selecting the item DEIMOS Engineering > Log files... > Log view... > df_watch_ccd log from the OpenWindows pulldown menu. or by selecting the item DEIMOS Engineering > Log files... > Log view... > ds_watch_ccd log from the OpenWindows pulldown menu. reading some other keyword from the same service. If that fails, then there is probably a problem either with the dispatcher that serves that keyword or the underlying hardware that that dispatcher controls. In the latter case: when the FITS file is missing keyword X from service Y but the watch_ccdlog file instead reports an error reading keyword Y from service Y, then the problem may be more indirect. Recall that once watch_ccd gets an error reading any keyword from service Y, it will not attempt to read any more keywords from that service for that image. Thus, an error reading keyword Z will not only cause keyword Z (from service Y) to be missing from that FITS file but any other keywords from that same service which have not yet been collected by watch_ccd for this image will also be missing. In such cases, you should then check the dispatcher that serves keyword Z along with its underlying hardware. The crate is asking for an IP address and is not being given one because the YP service does not know about it. Change the nsswitch.conf file on keamano so that it resolves hardware ethernet addresses directly from the /etc/ethers file. Dashboard window comes up with many imcomplete components listed, and numerous complaints about keywords it can't access. One or more computers or keyword libraries which server keywords are not running. Use the testAll or checktl commands to test keyword libraries. You may need to reboot CCD crates or restart software. The xbeeper sounds are very faint and are not eminating from the speakers. The sounds on the local machine (hanauma) are not configured correctly. In the popup audiocontrol window select "line out"
Ensure the volume is set to maximum value. kEventSounds/soundplay utility does not echo event sounds. The soundplay utility may not be running on your machine, the kevent sounds may not be up and running or there might be some other soundboard process running in svncserver2. If the process soundplay is not running in the local machine, open a terminal in the local machine and restart the process with the command soundplay. The DEIMOS rotator control computer (roto) is hung. Cycle power to roto as described in the instructions on rebooting roto and in the instructions for resetting the rotator controller. Mechanism move fails with error message "Error code -1: Someone needs to define an error message for this condition"
A motor move timed out or otherwise failed in a probably innocuous manner. Spectrum appears to be a dark image, although the shutter appeared to open. Grating tilt encoder controller lost power thus sending grating to the wrong tilt for imaging, or technician forgot to remove the grating cover when inserting the grating into the instrument. Attempts to change the dewar filter wheel to another position fail. Inspection of the Filter Wheel Select window show that the filter wheel is stuck between two positions and cannot reach either of them. A filter has not been loaded properly, and the filter holder is protruding from the wheel. Have technician remove and inspect the offending filter, then re-install it properly. The tent mirror does not position reliably; the piezo controller may not appear to be functioning; FCS may not be tracking well. The piezo dispatcher and/or controller operating the tent tent mirror may be in a bad state, possibly due to a power glitch. The tent mirror actuator is driven by a Physik Instrument P-845 Piezo controller. This controller is located in DEIMOS barrel electronics bay #2. 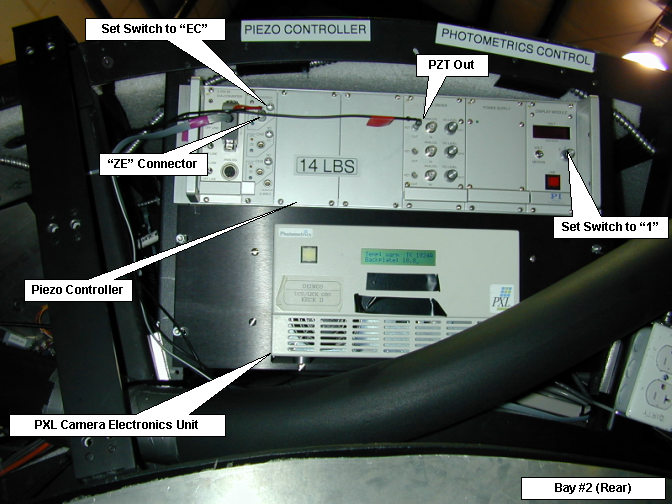 The piezo controller is located in the outboard position (i.e., farthest from the center of the rotation axis) of this bay while the DEIMOS PXL camera electronics unit is located in the inboard position. To access the piezo controller, rotate DEIMOS so that bay #2 is accessible, then remove the panel from the rear of the bay (i.e., the panel on the side of the electronics ring that faces away from the telescope). The main power button is the square red pushbutton located in the lower right corner of the piezo controller's front panel. Switch the controller's power off for 30 seconds, then turn it back on. Following a filter move, the filter name turns to Unknown. Inspecting the filter wheel position on the filter detail panel shows that the wheel appears to be at the proper position. The filter wheel is unbalanced and thus when the filter rotation motor is depowered at the end of the move, the wheel turns enough that its raw encoder position no longer matches the defined position within the tolerance of 1000 units. Have summit staff exchange filters in an attempt to balance the wheel. Have Lick software personnel modify the configuration file to increase the tolerance to an acceptable level. Dashboard pops up a warning message "Air pressure has been lost!" The pneumatic system on DEIMOS lost pressure, and pressure may still be out. If an exposure is in progress, abort it immediately. The loss of air pressure has likely caused the grating to unclamp, and if the exposure continues it will be ruined. If air pressure remains off, the CCD shutter will not close and the exposure will be ruined anyway. But if you're near the end of a long exposure, it's worth trying to salvage it. On the main Dashboard, open the Tricorder panel and check the barrel and cradle air pressure indicators at OKAY, then a problem exists. Have summit staff investigate the loss of air pressure. Note that the air pressure is interrupted momentarily once per day around 8:30am by the air water trap purge system. Occasionally, this system may trigger one or more additional purges following at 30 minute intervals if the original purge did not clear the trap. Attempts to change tilt of a grating stage fail. Trying to home the stage using the modify -s deimot G3TLTCAL=1 command yields a timeout error. The motor control process for this stage is hung, or the drive belt has snapped. Type the command unstick_grating n, where n is the number of the misbehaing grating (3 or 4), in a polo window to return the grating to normal operation. If this times out, then suspect that the drive belt on the titl stage is broken. The motor control process for this stage is hung. If this fails several times, then you can try the Galil controller reset procedure. Attempts to change tilt of a grating stage to zeroth order imaging position fail. Issuing the gozero command results in an error indicating that the move would exceed the allowable software range. Accumulated tilt corrections are too large. where X is the grating numger (3 or 4). Typically these parameters are 100 or less. Re-try the GO ZERO operation. Attempts to move the grating fail. Both gratings will not tilt. A review of the diagnostic sub pannel for the gratings reveals that there is an "ERROR: Controller CTRL2 is in MANUAL control mdoe." However, if you show the keyword show -s deimot man2con the result is "manual = auto." A check on the rotator sub pannel shows that the grating hatch is open. The grating sub system is lock out because the grating hatch is open. It may have popped open when the instrument was rotated. Have the summit crew rotate deimos to the grating load position and inspect the hatch. They may need to open and close the hatch again to get it to properly seat with the switches set. Then retry the grating moves. Attempts to move the grating tilt stage fail. The G3TLTLIM or G4TLTLIM keyword indicates motor in secondary limit. The grating subpanel on the dashboard indicates that the tilt of the grating stage is at a limit. The tilt stage has exceeded the allowed range of travel and has hit the secondary limit switch. This cuts power to the motor and prevents further motor moves. It is necessary for summit personnel to assist in moving the stage out of a limit. This operation presents a physical hazard to the operator because the stage could move suddenly when it is backed off the limit switch. Accordingly, this task should only be performed by a qualified instrument technician! to send slider 4 to the unload position. The technician can then access the stage through the grating changeout hatch. Open the grating changeout hatch. De-power the motor by unplugging the black plastic connector carrying DC power to the motor. Manually rotate the wheel on the friction drive mechanism to move the stage in the appropriate direction. An indication of the positive direction should be written on the wheel. If the grating tilt stage is in the negative secondary limit, you will need to move in the positive direction, and vice versa. You can monitor the current position using the G3TLTRAW or G4TLTRAW keywords to verify that the stage is moved in the proper direction. The technician may be able to detect the "click" of the mechanical limit switch when the stage moves off the limit. With hands clear of the tilt stage, restore power the motor by plugging in the black plastic connector carrying DC power to the motor. BEWARE! The stage may begin a tilt move when power is restored. When the stage is returned to a working state, re-home the tilt stage from the Initialize panel on the main DEIMOS dashboard GUI. Grating stage(s) fails to move, reporting a secondary tilt limit. However, the grating subpanel on the dashboard indicates that the stage isn't close to a tilt limit. The secondary limit switch is falsely triggered. Pull back DEIMOS from the science position. Remove front cladding to access the grating slide area. Locate the slider in question. Locate the wiring interconnect panel on teh grating slider. Disconnect the appropriate wires (detailed description TBD -- ask Wagner). Repeated attempts to unclamp the current DEIMOS grating fail. The pneumatic clamps holding the grating will not release. Try using the unclamp_grating command to unclamp the grating. By default, this will try 25 times to unclamp. If no success after 25 tries, go to next step. Have summit personnel disconect the air supply line at the rear of the instrument via this procedure. This should remove the air pressure and allow the clamps to release. The grating pin remains in even after all clamps are released. This is a tricky condition, since with the pin in you can't clamp up, nor can you unclamp. Here's one thing that has worked. then re-start the motor control software. This should release the pin. The grating will not move to the unload position, because the select stage hits a limit and the tilt move does not execute. GRSELORD=-3 as desired, but GRSELLIM shows a primary limit. The move cannot complete due to the limit switch striker being out of position. Use keyword-level commands to move the tilt to the unload position as described in this procedure. And the pin is out, the position reads -999, and the named position is unknown. We are at an unfavorable rotator postion where the gravity load prevents the grating from moving into position. to attempt to clamp up. Otherwise, simply re-try the move from the dashboard GUI. If the pin will not engage, then rotate to a PA that is 90 degrees away from this location and retry the grating move. If this fails, rotate another 90 and try again. If it is still failing, there may be additional problems. Can't set GRATEPOS=3, motor shut off - positioning error. The move failed, most likely due to excessive vibration in the lead screw generating an overtorque condition in the controller. This can happen in the vicinity of the slider 3 load position at certain DEIMOS position angles. Rotate DEIMOS to the position at which the grating system is horizontal. This corresponds to “Physical PA” (ROTATVAL) of -90 or +90 as displayed on the DEIMOS rotator subpanel. or alternatively use the Initialize panel on the dashboard GUI and click the Grating selectbutton. If the calibration succeeds, then re-try the original move. If it fails, suspect a mechanical problem. If the calibration does not succed, try to reset the Galil controller. The Galil controller may need a reset. Try the Galil controller reset procedure. Error trying to free grating and slitmask select stages TIMEOUT. The mechanisms recalibration procedure failed most likely because too much air pressure was built in the DEIMOS pneumatic system. Cycle the shutter mechanism several times to ensure that some of the air pressure is released. To do this bring up an xterm on polo (deimosserver) as user dmoseng and run the command cycle_shutter three to five times. Slitmask move fails; SLMSKMSG and/or SLSELMSG keywords report that move failed and motor is powered off. 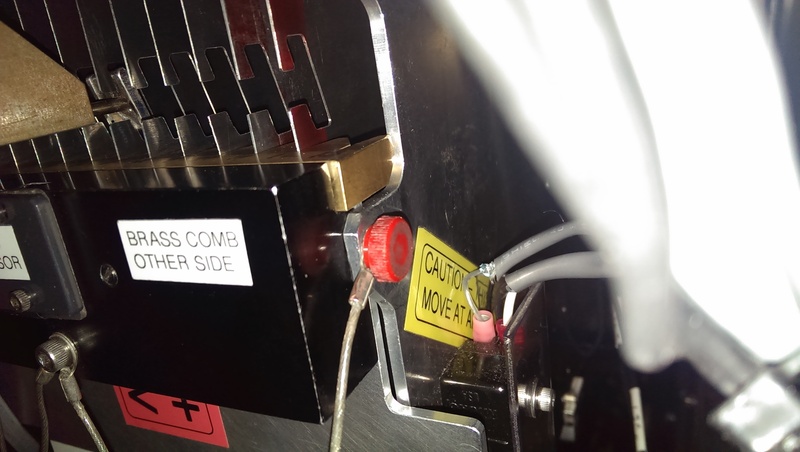 The motor move has failed due to a bad reading on a switch, usually either the one on the slitmask arm or on the door comb. Rotate DEIMOS to the slitmask unload position (ROTATVAL=-90) and try the move again. If this works, then quit. Attempt to calibrate (home) the stage (mmot slselcal=1). This may succeed, in which case you can quit. Have summit support attempt to move the slitmask selector motor manually. Attempt to calibrate the stage. Slitmask sub-panel gui shows a red box for "missaligned"
When you attempt to move, the "comb" box on the grating sub-panel flashes red. Slitmask detail panel on DEIMOS dashboard indicates comb error when attempting to move a mask. 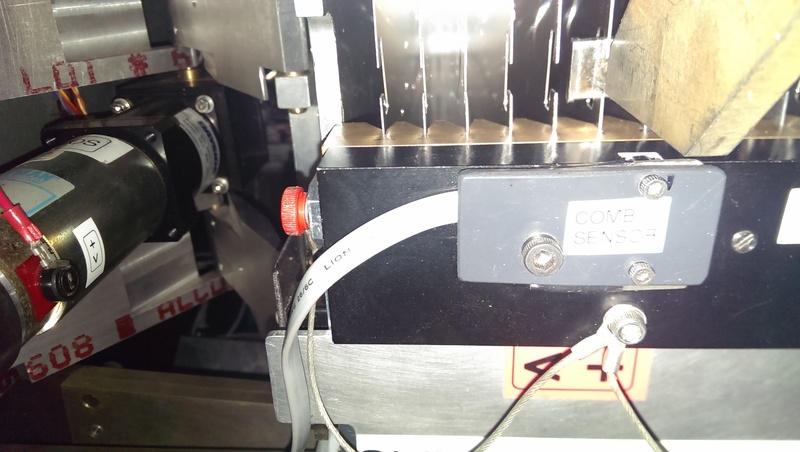 A slitmask is sticking on the mask pusher mechanism, triggering the comb sensor. The slitmask system cannot be moved until the mask is freed from the pusher bar. The comb was bumped in the process of moving a slitmask into beam. The comb needs to be re-aligned. You can rotate manually and test slitmask moves or execute the following. This will launch a script that will rotate DEIMOS in 45 degree increments until the mask is freed. If this script fails to free the mask within one full revolution (8 iterations), then type CTRL-C in the xterm window to interrupt the script and proceed with the manual recovery process described below. Have summit staff send rotate the telescope to a position allowing access to the Keck II right Nasmyth platform. On the Dashboard's rotator subpanel, set allow DCS control to no to permit local control. On this same panel, click the Unlock button to allow the rotator to move. Using the deimos rotator sub-dashboard, enter a rotator position of -80 (or 280) to allow summit staff to access the slitmask hatch, or have the OA rotate to stationary position 0 deg. Have summit staff open the access hatch using the screwdriver at the instrument. signs of a mask stuck on the comb. Check for a comb missalgnment. 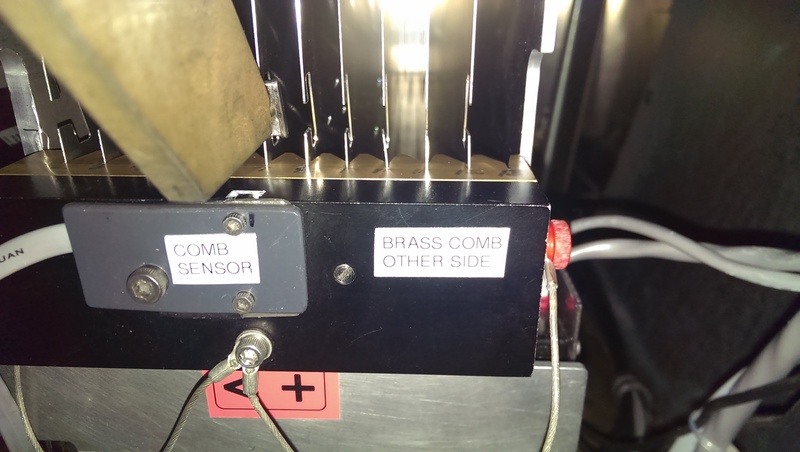 Gently push the brass comb left and right to see if the comb missalignment error will clear. Image of the comb properly aligned. The edges of the brass comb are flush with the bracket. Notes: During one error on May 13, 2015, the brass comb overlapped the black anodized support bracket on the left side of the comb by 1/32. A visual inspection suggested the comb was aligned but when the brass comb was flush with the bracket, the missalignment cleared. If a mask is sticking, have summit staff remove this mask by undoing the 2 thumbscrews on the slitmask door, flipping down the door, and pulling out the mask. You can run without that mask installed the rest of the night. Close the slitmask door and shut the access hatch. Verify that the slitmask select stage will now operate freely by by selecting mask 2 and mask 12, thus running the system from end to end. Allow DCS control of the rotator. Have the OA run a stand-by init on the rotator. Attempting a slitmask move fails. See procedure for dealing with jammed slitmask. Attempting a slitmask move fails, but inspection of the masks shows that the masks are not jammed. A slitmask may be missing its fiducial hole. Remove slitmask and check to verify that all of them include a square hole on the bottom about 12 inches in from the end with the hot dog cutout. If any such bad masks are found, remove them from the instrument. Slitmask selector might be jammed, or might have lost its calibration. While the FOP is on, try to determine position of the slitmask arm, or slitmask. Attempting a slitmask move fails and you have already checked that no mask is jammed. Attemps to recalibrate the mechanism fail. The Galil controller may be failing and needs to be reset. Please, follow the Galil controller reset procedure. The testAll script reports that the clock on one of the motor controllers has failed, or that the Bekins/Uhaul/Monitor processes on one of the DEIMOS motor controllers are not running. The motor controller has faulted. From the main DEIMOS dashboard, click the daemons button to raise the daemon subpanel. Use the displaeyd status information on the daemons subpanel to verify the fault reportd by testAll. Use the Ctrlr 1 Reset or Ctrlr 2 Reset buttons as required to attempt to reset the controller. If this fails, proceed to the next item. The testAll script reports that the clock on one of the motor controllers has failed, or that the Bekins/Uhaul/Monitor processes on one of the DEIMOS motor controllers are not running. Attempting to reset the controller from the dashboard's daemons subpanel (as described above) fails. The motor controller has hung. Log in as kics to keamano. (where n=1 or 2) to verify that the appropriate dispatcher was restarted properly. (where n=1 or 2) to restart. Additionally, the command ctx (executed as dmoseng in polo) shows an error message in the dispatcher2 prcesses listed under "Current KEAMANO tasks". If there is a dispatcher2 process running, then the connection error message shown by the telnet command is normal, because the dispatcher is already communicating to the Galil controller through the same port you are trying to use. The port on the Lantronix unit connected to the Galil controller is hung. Follow the Lantronix port reset procedure. Motor moves fail. Running testAll indicates a problem communicating to the Lantronix one of the Lantronix units (deits2 or deits3). The Lantronix unit is hung and need to be reset. The AUI (10Base-2 transceiver) which connects the Ethernet coax cable to the multi-pin port on the Lantronix unit is loose or broken. The Ethernet coax cable is damaged. Follow the procedure for power cycling the Lantronix unit. Check cabling for loose conections or damaged cable. Try swapping the AUIs on the two Lantronix terminal servers, then run TestAll to check whether the problem follows the AUI. If so, replace bad AUI. Try running alternate Ethernet cable between the units to check for bad cable. Try replacing the Lantronix unit with spare. The testAll command reports that one or both of the ion pumps is off. This is very likely to happen after a power glitch or power outage at the summit. The ion pumps need to be turned on. Go to the DEIMOS dashbaord GUI and click the Tricorder panel. Verify that the status of IONPUMP1 and/or IONPUMP2 is OFF. Also check the dewar temp; if the dewar temp is well above -100 C then you may not be able to start the ion pump. Click the Restart button under the appropriate ion pump to attempt to restart the ion pump. The status should change from OFF to starting. If the startup is successful then the status will eventually change to on. If the startup fails, the status will return to off, and you should try again to start the ion pump. Even if the dewar is cold, numerous restarts may be required before the ion pump will stay on. Note that the vessel pump is off. Check again the status of the ion pumps using either the smot or the testAll command. You may have to do this more than once. Double-check the pump status for a few minutes to make sure that both are on. Rotator will not go into DCS control mode; attempt to modify ROTATMOD to DCS yields an error about INSTRUME and FOCALSTN not being set properly for DEIMOS. Open a window on polo as user dmoseng (the processes run on kics). which will repeatedly reset the daemons until they are all alive. Optional: once the restart completes, verify that all is well by issuing the command deirot status; the output should resemble this. The observer must click the Allow DCS Control button and then select the yes option to enable DCS control of the rotator. The OA must do a Standby/Init on the rotator to re-initialize the rotator. Note: If restarting the deirot process fails to fix the problem, the real problem may be that keamano has stopped forwarding IP traffic to roto. See this document for details. See corrective actions described above. The rotator stops following the pointing demands from DCS. FACSUM reports incorrect drive angle on the rotator. The timestamp and demand keywords are not always in the correct order (rotdets-->rotpdsts-->rotdets2). Restart the Linux DCS gateway. At the beginning of the night, pointing appears to be way off; stars not visible in guider. Either the rotator has not been initialized and placed into DCS mode, or the DCS does not know the rotator position. Run testAll to verify that the instrument and telescope settings are correct (e.g., selected instrument is DEIMOS). If the rotator was not initialized at the start of the night, then follow these instructions to do so. If you have not yet commanded a rotator move, have the OA send the rotator to any angle (e.g., 0°). Verify on FACSUM that the rotator is in position angle mode. When sending a rotator move, the rotator unexpectedly executes a large slew to the home position. The rotator software determined that the discrepancy between the readings on its two absolute encoders was too large and decided to home itself in order to reset the encoders before proceeding. Allow the move to complete, then proceed with observing. Note that properly initializing the rotator at the start of each night should generally prevent this from happening. At the start of the night, the OA cannot perform the STANDBY/INIT operation on the rotator. The rotator software on roto is not communicating properly with DCS. If that fails, restart DCSGUI. If that fails, reboot TDC and AUX, then restart DCSGUI and perform another deirot_restart as dmoseng on polo or deirot stop|start as kics on keamano. A problem in the rotator angle interpolation routine. A failure in the communication between DCS and the DEIMOS rotator. Failing to issue this command could cause the rotator to fault again after re-initializing. Perform an INIT (not necessary to do STANDBY/INIT) on the rotator. If the previous action does not work and the value of the demand out of limits continues increasing, then restart the rotator daemons by typing deirot_restart in a polo teminal as user dmoseng. If the previous action does not work, then restart TDC/AUX followed by deirot_restart. When the OA attempts to send a rotator move, SKY complains that the requested angle is out of range for the DEIMOS rotator although it is clearly a legal request. The rotator limits are not properly defined. If you get zero values back, have the OA re-load DEIMOS as the current instrument. watch_rotator, the program that monitors DCS position broadcasts of ROTPDEST and extrapolates the required (x, vel, accel), is issuing velocity and accel values (NaN's). Typically, this occurs when watch_rotator is receiving bad values from DCS (perhaps due to one of those infamously sketchy EPICS/CA connections), and therefore it cannot fit a curve with appropriate velocity and acceleration. Log in to polo as user dmoseng. After 30 seconds, use the testAll command to check the status of the system. If problems are shown, issue the command deirot status from roto as kics; the output should resemble this. The OA must do a Standby/Init on the rotator to re-initialize rotator control. LEDs on the DEIMOS rotator handpaddle are flashing. The rotator needs to be re-initialized. Close all DEIMOS hatches and release the band brake. Switch the toggle switch on the DEIMOS handpaddle to COMPUTER. Open an xterm on polo. Answer 'y' when prompted whether you are sure you want to home the rotator. Allow the homing operation to complete. Rotator will not move or initialize. The Rotation subpanel on the DEIMOS dashboard indicates ESTOP from DCS. The rotator is disabled because the Keck II facility ESTOP circuit was de-activated, either because someone pressed a facility ESTOP button or because of a power outage. Follow the DEIMOS Rotator Controller Reset Procedure. Verify that the ESTOP from DCS indicator on the dashboard's Rotation subpanel is no longer lit. Rotator will not move or initialize. The Rotation subpanel on the DEIMOS dashboard has a lit Panic Button. Verify that the Panic Button indicator on the dashboard's Rotation subpanel is no longer lit. Rotator is inoperative from the handpaddle. Attempts to log into the rotator computer fail. The Linux PC, roto, does not have any lit power indicator when power cycled.. The DEIMOS rotator computer is dead. Complete the procedure to replace the DEIMOS rotator computer. DEIMOS will not rotate via handpaddle or computer control. For servicing, rotate DEIMOS manually using the manual rotation procedure. The Rotator Control GUI shows the flag Computer Bypass in red. The rotator toggle bypass switch is in the BYPASSED position. Have the summit crew change the toggle bypass switch to NORMAL (see Figure 2 in manual rotation procedure). Verify that the CCD shutter is open. If the I or Z band filter is in use, ensure that teh CuAr lamp is turned on; the LED does not emit at these wavelengths. If still no light, try switching to the LED lamp by requesting a direct-mode calibration image on the FCS Setup GUI. If still no light, acquire a spectrum with the science array and check whether any light is received. If not, send someone up to check whether the grating cover has mistakenly been left in place. If still no light, check whether the science spectra appear shifted to the left or right relative to the expected positions based on the slit layout. If so, the grating may not be properly seated. FCS image shows light but software cannot lock on to image and complains that the offset is too large. The grating tilt is not correct and the image is shifted. Verify that central wavelength and filter are set to exactly the correct values for FCS. If they are not, then the FCS GUI will show Lockout status. The grating tilt encoder has lost its position so the actual position does not match the reported position. Either the FCS reference image or the new FCS image contains a substantial cosmic ray. Grating became unclamped due to a loss in DEIMOS air pressure. Grating was not properly installed in its mount by summit technician. Re-home the grating tilt mechanism by either clicking on the RE-Cal button in the grating detail panel or typing "mmot g#tltcal=1" at a polo prompt, and where "#" is either "3" or "4". Inspect the FCS reference image for cosmic rays and if needed, re-take the reference image. Unclamp and re-clamp the grating via the dashboard. Have summit staff remove and re-install the suspect grating to ensure that it is seated properly in the slider. You want to match against a previous observation, but the FCS GUI setup panel does not allow you to select the “Match Previous” option. Either the FCSTRACK script is not running, or there are no saved FCS setups which match the current setup. Run testAll to confirm that FCSTRACK is running. If not, restart it from the FVWM background menu. Go to the current FCS directory (via cdfcs) and verify that an FCS reference file exists with the grating, slider number, central wavelength, and blocking filter that exactly match the current settings. An attempt to use the "Match Previous" feature of FCS fails with the error Dewar X translation stage hit a limit. The grating is either improperly seated now, or was improperly seated when the original FCS reference exposure was taken. Alternatively, changes to the grating cell, grating system, or grating parameters (e.g., GRATOFFx) may cause the grating to clamp up in a slightly different position and thus shift the images. See also next item. Compare Y positions of the same reference spots on the original FCS reference image and the new reference image. Verify that they are separated significantly in Y. If not, then the problem is elsewhere. Have summit staff unload and re-install the grating. Re-try the ``Match Previous'' operation. If ``Match Previous'' continues to fail, then some change in the grating system may be the cause. In this case, matching previous may not be possible. When attempting to use the "Match Previous" function on the FCS setup GUI to match to the previous night's FCS reference image, the attempt fails with an error "unable to match". Comparing the current FCS image to the previous reference image shows a large spatial offset. The grating tilt encoder has slipped and the new image is not properly registered. Note: if using slider 4, specify g4tltcal=1 instead. Re-try the match previous operation. If FCS still cannot match, use the fcsmov command to steer the current image so that it matches the previous reference image. FCS issues moves but does not converge on the target, which keeps bouncing back and forth in the X direction. The piezo controller/actuator is not functioning properly. Inspect cabling at the FCS controller (located in DEIMOS barrel electronics bay #2), particularly the high voltage line coming out the center of the controller. If cabling looks fine, check that the FCS controller channel is working properly by using one of the other channels on the controller (consult Lick first). When attempting to run fcstrack, the script dies with an Subscript out of range. error. The script attempted to read an undefined keyword. On the DEIMOS dashboard, click the Initialize button to bring up the Initialize subpanel. FCS refuses to lock in due to a lockout condition, which is claimed to be a focus mismatch although the focus is correct. The focus tolerance keywords are not initialized properly. FCS remains in lockout condition even when the grating, central wavelength, filter and focus values all look correct. It complains that there is no setup for the current configuration. Beware especially after a mask alignment. Usually, the central wavelength of the grating is slightly off from reference value. There is finite resolution in the tilt mechanism and sometimes the "Go Back" function of the grating does not set the exact wavelength. Move off the central wavelength, then back again. In the main Dashboard GUI, change the central wavelength by 1 Angstrom. FCS cannot track. Looking at FCS images reveals that one of the two FCS CCDs is not reading out (i.e., half of the FCS image displayed on FIGDISP contains all zero-valued pixels), although the other CCD looks normal. The signal chain for one of the FCS CCDs is interrupted. WARNING Do not attempt to power cycle or reboot the FCS system. If you do, the FCS system can get caught in a catch 22. Without a proper cabel connection you can't boot, but to test the connection you need to boot and take an image. Yikes. Trouble shoot only during the day, and an expert technician at the summit will need to check and repair the cabling to make a permanent repair. Log in to polo as user kics. Verify that FCS is now able to track. The last time this occured we have the following error: Daylog ticket 19923: "Found that the cable between the FCS CCD electronics crate and the dewar was causing the bias voltage problem (bias jumps or completely dead). We found two spare cables and used one to replac ethe cable. This seemed to fix the bias problems on CCD#1." Rotated the instrument 1440 degrees and both FCS CCDs behaved normally. FCS complains of a lockout situation because the dewar stage is at a negative/positive limit. FCS cannot re-position the dewar stage to correct for differences between the FCS reference image and the current FCS image. One problem may be that the grating is improperly clamped either currently or when the reference image was acquired in the afternoon. If the grating is improperly clamped, the result could be large shifts between FCS images. Try simply unclamping and reclamping the grating. If it does not work the first time, try it once more. Have the OA to record the current position and to stop guiding. Run Select Slider 3|4. This should insert the grating using the correct rotator angle. Wait for FCS to track. FCS might take a couple of minutes to track, because the dewar stage has to move away from its limit. Once FCS is tracking, have the OA to start guiding again. Check that your target is correctly aligned. If you are not certain of when the grating was improperly campled and the previous options did not work, rotate the instrument 90 degrees from the current position or to -30 deg (about the rotator value set by FCS setup in the afternoon). Then try unclamping and reclamping the grating. If this is done during the night while the instrument is guiding, it will require coordination with the OA, since the guiding should be stopped. If none of the previous options work, the current position of the grating is likely not at fault. It may have been that the grating was improperly clamped when the FCS reference images were acquired. If this is indeed the problem, then an FCS image will need to be retaken as a reference. You will need to unlock the rotator and dis-allow DCS control of the rotator. Next, reacquire FCS images following the afternoon procedures. When finished acquiring new FCS images, you will need to put the rotator back into DCS control and have the OA do a standby-init on the rotator. FCS images are flipped left/right or the spectrum appear shifted left/right relative to the FCS reference image. When FCS is tracking, large cross correlation errors are reported by the FCS error handler. This problem is attributed to attenuated signal in the fiber optic digital communications link between the FCS CCD controller (inside DEIMOS) and FCS CCD VME crate (in the Keck-2 computer room). This problem may not be solved at night. A technician will need to clean the FCS fibers and reseat the boards during the day. When taking reference image or starting FCS tracking, the ccd reads out but no image is saved and a 30 seconds timeout warning appears. The FCS ccd crate become unresponsive. Wrong directory permissions: the account running the fcstrack script does not have write permission to the current output directory. Compare the group membership and the write permission of the current outdir with the other numbered (user) accounts. In at least one case, we found that the outdir belonged to group deimos rather than to the group instr. Have the SA check the proper group memberships, and if neither you nor the SA can change them, request the help of the software on call person. Unfortunately, this problem also crashes the FCS ccd crate which needs to be rebooted and restarted (see the FCS CCD powerup procedure). The FCS watch_ccd daemon is in a bad state. and then re-run testAll to check status. Guider cannot be selected from Xguide. Guider is powered off or requires a power cycle. This should take about one minute to complete. Guider can be selected from Xguide but images from the guider do not show stars or only a portion of the field (top 1/3) show stars. Either the guider is not properly configured or the shutter is broken. Verify that the DEIMOS hatch is open from the main Dashboard panel. On the Dashboard's TV Guider subpanel, verify that the TV filter is set to a reasonable value (e.g., R). If it is set to Home, select R.
On the Dashboard's TV Guider subpanel, verify that the TV focus is set to a reasonable value for the selected filter (e.g., 970 for R). Note that 1 is not a reasonable value. Note that the default value for the guider filter and focus is R & 970. If you suspect that the defaults should be in use, reselect these values. If still no good image, close the hatch, turn on the Qz lamp, and see whether any light is seen on the image. If no light is seen, the guider shutter may be inoperative. Replacing this is an extensive job for the day crew. Light is seen on the guider images, but the images appear "smeared" horizontally. The serial clock card in the guider controller is malfunctioning. Repairing this is a full day's work for a talented daycrew. Have daytime summit staff pull DEIMOS, remove access panels on front of instrument, and check serial card in the guider head. When offset guiding in vertical angle mode, the guide star is stationary but the target does not stay in the slit. The wrong guiding mode has been selected, so the center of rotation is set to the guide star rather than the slit. Please see table on guiding modes. This is a case of offset guiding. Center of rotation needed to be set and then start guiding with "On Star" button. After running AUTOFOC to focus the telescope, the secondary mirror position is more than a few tenths of a mm away from the nominal value of 0.8 mm. The TV camera focus is not set correctly. On Dashboard, click on the TV Guider button to call up the guider window. Check the displayed TV camera focus value, which should be around 1000 units. Change this value as needed and click the MOVE button to make the change. Re-run AUTOFOC and verify that the value has changed. When running Mira, the images are badly out of focus. The telescope is badly out of focus, possibly because the DEIMOS TV camera focus is not set correctly. See the description for AUTOFOC returns abnormal telescope focus value. The wrong version of AUTOFOC was run. There is a SunOS version for use with the SunOS guider, and a Solaris version for use with the Solaris guider. Run the correct version of AUTOFOC. Data directory, filename prefix, etc., are not properly reset after running MIRA. The MIRA script failed to complete. This should restore the pre-MIRA settings. MIRA images show a steep top-to-bottom gradient in the brightness of the segments. This is not generally a problem, just a benign symptom of using the 900-l/mm grating. As long as all segments can be identified and MIRA completes without error, no additional action is required. Subsequent attempts to analyze this same image yield the same error. The xbox program attempted to read the image before it was fully written. Type flpr and re-run xbox. If that fails, restart IRAF and re-run xbox. If that fails, inspect the image header (execute the command fv -cmap 2 filename on polo) and verify that the specified extension exists in the image header. The FITS header extension called DesiSlits is not being read by the software, either because it does not exist in the image header or because IRAF can't read it. Verify that a slitmask is in place (the DesiSlits extension is not written when slitmask is set to None or Unknown). If not, insert mask and re-run xbox. Use the FV scroll bar to check for the DesiSlits extension. If DesiSlits is found, then try restarting IRAF and re-reading the file. If DesiSlits is not found, then run the command check_fits_chunks to determine whether the FITS chunks are on disk. Verify that slitmask list agrees with expectation. Run the command check_fits_chunks to determine whether the FITS chunks are on disk. If not, then seek help. Then try taking a new alignment image and running the alignment software. When xbox is run, it crashes with a floating point error when it tries to analyze a certain box. A truncated box (i.e., one that is at the edge of the CCD) may cause this to occur. The mask must be re-analyzed with the offending box excluded. Identfy the bad box in the ds9 display (not the one being used with IRAF; refer to the one displaying the outcoming DEIMOS images). Note the PANE corodinates of the bad box. In IRAF, run the command get_boxes image, where image is the name of an alignment image, to generate a "boxfile" (text file) listing the boxes (generally named box.maskname). Edit the boxfile. Locate the line corresponding to the bad box by comparing the PANE coordinates. Delete the line and save the file. When xbox is run, it beeps and complains STAR SKIPPED when attempting to locate certain stars. The alignment boxes were not found at the expected locations in the alignment image, probably due to either uncorrected flexure or changing to a different grating. to adjust the pointing model so that the guide boxes are found. Note that after you mark the location of the alignment box, the program will invoke xbox in practice mode. Re-run do_xbox to compute and send telescope moves. During the afternoon checklist, SAT gets stuck when trying to display one of the user-defined slitmasks. The IDL window (slit_align) shows an error message and its prompt is active. Note that the IDL window (slit_align) is minimzed in the lower region of the VNC window, hidden behind the main SAT GUI. To bring up the slit_align window, double-click on it when it is minimized once you have shifted away the main SAT GUI. There is some problem with the mask geometry, which does not allow boxes identification using the information in the image header. At the slit_align IDL window prompt, execute the command retall to restore all IDL internal variables. In the main SAT GUI, select the tab Options. Change the Box file format to maskname.box. Select the tab ID boxes. Load the desired image in the SAT display. This may take a few seconds. Once the image is loaded, NONE of alignment boxes will appear enclosed in a square box. Place the cursor on each of the alignment boxes and press m to mark them. A red square should enclose each of the identified boxes. Once you are done selecting manually all alignment boxes for the mask, open a terminal and type cdata to change to the directory where DEIMOS images are being saved. List the files in the data directory to check a file named box.YourMaskName exists. The file should contain a list with the coordinates of all identified boxes for that particular mask. Change the Box file format to fits.extn. IMPORTANT NOTE: During the night, when doing the on-sky coarse alignment for this mask, make sure before starting the alignment, the Box file format option in the Options tab is set to maskname.box, but only for this mask. The Box file format option should be fits.extn for any other mask whose boxes were identified automatically rather than manually. % ABS: Variable is undefined: DX. There is a big shift in the mask alignment image, which caused the boxes not to be where the SAT software expects to find them. This might be related with instabilities in the grating tilt mechanism. A possible way to solve the problem is to ensure that FCS is tracking before taking the alignment image. Make sure that SAT is recovered, either by restarting it or by typing retall and .reset at the IDL prompt in the slit_align terminal. In the DEIMOS Dashboard GUI, select the science wavelength in the GRATINGS panel. Check if FCS is tracking. In case FCS is not tracking use the Fix FCS tool from the background menu: DEIMOS Troubleshooting --> DEIMOS Trouble Recovery --> Fix FCS. Note that Fix FCS should be executed in a blue desktop VNC session. Once the FCS is tracking, go back to SAT and Start Fine Alignment. The SAT cannot find the fiducial stars in most of the boxes, even though the stars can be clearly seen within the boxes in the fine alignment images. This problem occurs even with FCS in tracking mode before the alignment image was taken and also having made sure that the afternoon mask images were taken with the grating selected using the "select slider command". Still, boxes identification using the information in the image header is not possible. Load the desired image in the SAT display (either an image from the afternoon mask identification procedure, or the latest fine alignment image). This may take a few seconds. Once the image is loaded in the SAT display window, there are two options: (1) All/sufficient alignment boxes are detected automatically (boxes are enclosed in a red square), (2) NONE of the alignment boxes appear enclosed in a red square. If none of the alignment boxes are automatically marked, place the cursor on each of the alignment boxes and press m to mark them. A red square should enclose each of the identified boxes. Use d to delete unwanted/mistaken identifications. Once you are done selecting manually all alignment boxes for the mask (or in the case the boxes were identified automatically), open a terminal and type cdata to change to the directory where DEIMOS images are being saved. List the files in the data directory to check if a file named box.YourMaskName exists. The file should contain a list with the coordinates of all identified boxes in that particular mask. In the main SAT GUI, select Actions --> Load Fine Alignment Image and select the last fine alignment image. When the summit mask milling maestro attempts to mill a mask, the sequence fails with an error like: "Block 43, error 401 x-axis software over travel. press esc to continue." On occasion, the memory card in the Milltronics system may become corrupted and lose the stored parameters from its memory. This may cause the mill to drive the table into a limit or refuse to mill a mask because the coordinates are illegal. This results in an x-axis over travel condition. When scanning a filter or grating barcode, the instrument responds with a "bad" signal (3 short honks). The stage was not at a defined position. Unless the position is defined, DREMEL will not accept the barcode. Verify that you have a green light from the stage's position indicator before you scan. If not, re-select the position using the local controls on the instrument. When a barcode is scanned using the handheld barcode scanner, the scanner beeps an acknowledgement but DEIMOS does not give the "honk" response. Either DREMEL or the bargun dispatcher is hung or otherwise unresponsive. Verify that the DREMEL and Hand Held Barcode Scanner lights on the intrcon GUI are on. If not, restart these processes using the instructions available by clicking with the left mouse on the name of the process. On the DEIMOS dashboard, double-click on the Slitmask box to launch the Slitmask Panel. On the Slitmask Panel, click the dremel button at the lower left to launch the dremel monitor panel. Click the Hello? button and verify that the message Hello! appears at the top of the panel. If not, restart dremel per the instructions on intrcon. Have a summit technician scan the barcode on a grating or filter, or scan one of the barcodes on the laminated sheets attached to the instrument. Repeat the above steps and verify that dremel now recognizes the bar gun signals. The automated Count/Scan operation to get the slitmask barcodes terminates with an error about mask scanning, indicating either that an incorrect number of barcodes were received or that invalid barcodes were scanned. The barcode reader incorrectly scanned one or more barcodes. Follow these steps to manually fix the barcode list. Note: unless you really know what you're doing, it is best to leave this to a DEIMOS expert. In the main DEIMOS dashboard, double-click in the brown slitmask box to load the slitmask subpanel. On the slitmask subpanel, click the dremel button to load the DREMEL subpanel. On the DREMEL subpanel, click the Emergency/Diagnostic Tools button to launch the dremel Emergency/Diagnostic Tools subpanel. On the dremel Emergency/Diagnostic Tools subpanel, click the Get barcodes button. The current barcode list will be copied into the text box below that button. In the text box, enter a comma-separated list of the correct slitmask barcodes starting from slot 2 and continuing through the last occupied slot. Be sure there is a one-to-one correspondence between barcodes and occupied slots (as indicated by the DREMPOPS keyword in the DREMEL subpanel). Do not press the Tell dremel button yet! which indicates that the FITS-writing process has run to completion. If not, then the process may be hung and you have a bigger problem which may require a keamano reboot. On the dremel Emergency/Diagnostic Tools subpanel, click the Tell dremel button to force regeneration of FITS chunks. On the dremel sunpanel, click Commit! to save changes. Remember that the dashboard must be restarted in order to show the revised list of gratings, filters, and slitmasks. When the Review Config (aka tkremel) widget is launched from the DREMEL panel, it does not show the expected changes to the current configurations on filters, gratings, and slitmasks. This is a known feature of tkremel with a simple solution. Use the Quit button to exit tkremel. Re-launch tkremel and all should now be well. Clicking the Review Config button on the DEIMOS does not bring up the tkremel window previewing the new configuration. A possible cause is that the resulting configuration is invalid and cannot be displayed, perhaps because the same name appears in two different positions. As an example, the config below lists two Long1.0B masks with different barcodes. Because the names are the same, dremel fails. Inspect the file /local/kroot/data/deimot/dyna/dremel.cfg. Check the listings for filters, gratings, and slitmasks looking for identically-named elements in two positions of the same sytem. Launch dashboard via the command dashboard-dev. From the slitmask panel, click the dremel button to launch the DREMEL subpanel. ERROR duplicates in stage position data! Removing the duplicate from the instrument if there are two masks for instance with the same name. If duplicate names are not in the instrument, then try re-scanning the elements in the affected stage. From the main DEIMOS dashboard, double-click in the slitmask box to bring up the slitmask panel. Click the dremel button to bring up the DREMEL panel. Click on Review Config and verify that it runs and displays the new configuration properly. DREMEL dies while attempting to initialize, or at the completion of a slitmask scan when attempting to read recods from slitmask database. The DREMEL panel on the DEIMOS dashboard indicates an unusual failure on the top status line. The summit instrument Sybase server is not responding properly and requires a reboot. Use ping waiaha to determine whether waiaha is alive. Have summit staff determine whether waiaha is functioning properly, and reboot if needed.